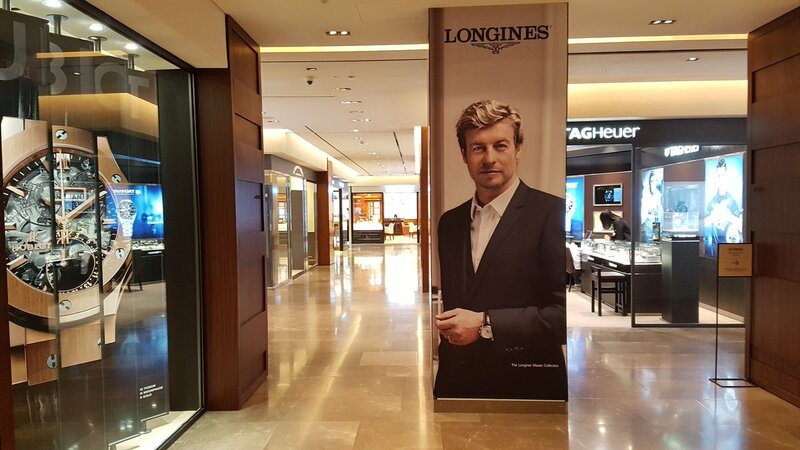 "WHEN YOU ENTER SHINSEGAE AND SIMON BAKER IS WAITING FOR YOU I'M SO NOT SCREAMING"
Wow!!! I don't think I'd get any further than the entrance. Thanks for posting Raven. Thanks Raven. I think I'd linger there awhile too! So cool.Thank you Raven. I remember when I was at Nice Airport and there was such a big photo. I didn't mind at all that my flight was delayed for an hour. Just sat near Simon and enjoyed that photo . Thanks Raven. It's brilliant I think I'd stand there and look like an idiot!! Thanks Marie for the lovely big photo! So handsome. Raven- when I was in an airport with a giant Simon advert I kept doing laps just to walk bye! New old (again, thanks Sara Pettarini) : No date, but I think 1992. I've update the "Magazine & Scans" section of the gallery, with a corrected perspective for the poster image. Thank you Marie. He was (and still is) a cutie! Good interview. Thanks for taking the time to find these great tidbits! Simon Baker and Helen O’Connor in the play “EUROPE” by Michael Gow. From The Sydney Morning Herald July 17 1994, The Sydney Morning Herald July 11 1994 and Dolly Magazine.